The already heated debate over new gun control measures heats up as Gov. Martin O’Malley’s proposed new restrictions moves to the Senate floor on Tuesday. 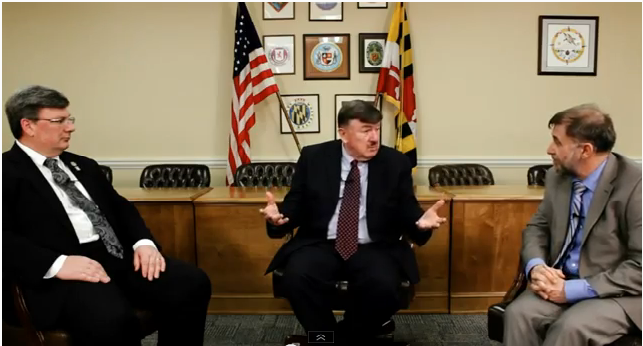 In this 12-minute video, MarylandReporter.com pits Del. Mike McDermott, a Lower Shore Republican and police officer who opposes new gun licensing rules, against Vinny DeMarco, a long-time advocate for more gun control who heads Marylanders to Prevent Gun Violence. Editor Len Lazarick conducted the interview, directed and edited by Fosie Weston of OntheHillMedia.com. Health care advocates are stoking the tax fires again with legislation that would make Maryland’s tobacco taxes some of the highest in the country. The Senate Budget and Taxation Committee heard testimony Wednesday on SB 589, which would increase the tobacco tax rate from $2 for a pack of cigarettes to $3. The bill also calls for steep hike on all other tobacco products — from 30% to 95% of the wholesale price.